Accessorize your shop with bold graphics that serve as valuable references for your team! 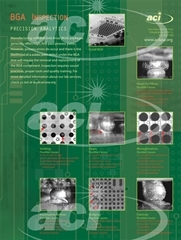 X-ray and SEM-generated photos of the most common defects and their causes encountered in electronics manufacturing today are boldly featured on this poster to display in the shop. It's an excellent way to keep these signs of trouble top-of-mind. Each poster is printed on glossy photo paper using high quality HP Vivera Inks. The three ACI logo watermark images do not appear on the actual poster. Poster dimensions: 24" x 32"